Bank of America has been a global partner of Special Olympics since 2003. Their long history of support, began at the state level and spans over three decades, as part of their ongoing commitment to achieving the goal of a more diverse and inclusive society. In 2015, their robust support was invaluable in continuing to raise awareness, connect communities and encourage participation in the Special Olympics movement. 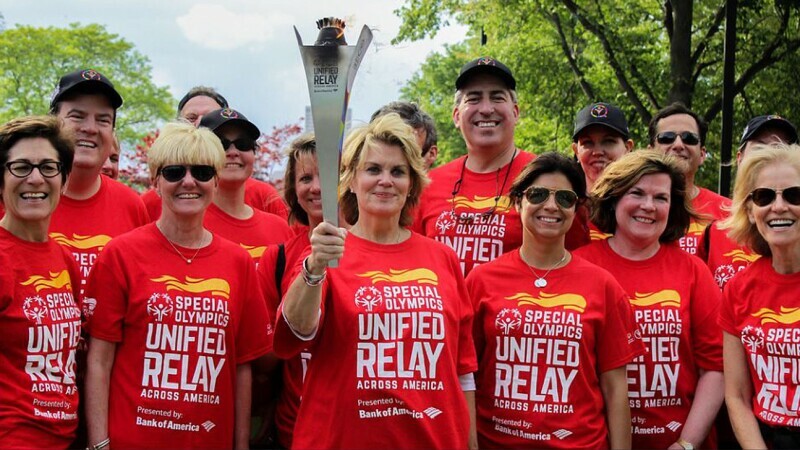 As the presenting sponsor of the first Unified Relay Across America, over 10,000 torchbearers carried the Flame of Hope to 50 states through the course of 46 days, lighting the way to a future of inclusion and respect for people. Bank of America launched a multichannel #PASSTHEFLAME campaign during the relay, which culminated at the Opening Ceremony of 2015 Special Olympics World Games in Los Angeles, where Bank of America was also the official bank partner of the games. In partnership with ESPN, they also launched the Total Inclusion initiative where former Special Olympics athlete, Dustin Plunkett was a reporter providing coverage for the Games through the eyes of someone with intellectual disabilities. Additionally, 260 Bank of America employees were official volunteers for the games and over 2,500 employees were Fans in the Stands supporting the athletes competing in Los Angeles. In 2015 alone, Bank of America employees volunteered over 32,000 hours in support of Special Olympics. The bank also continued their commitment to the athlete leadership program with their support of the current class of Sargent Shriver International Global Messengers. In 2016, Bank of America also committed to continuing their support of Special Olympics USA as the premier sponsor for the delegation competing in the upcoming 2017 Special Olympics World Winter Games in Austria and the 2019 Special Olympics World Summer Games.